A wall mounted soap dispenser removes the ugly sight of bottles from around the bath, they add a touch of quality and luxury to any bathroom and bring a hotel feel to your home. Wall mounted soap pumps are great for around showers as it prevents the need to unscrew bottles or lids with wet and soapy hands. A simple push dispenser allows soap, shampoo, conditioner or lotion dropped into your hand at a push of a lever. We have rounded up 10 of the best wall mounted soap pump dispensers on the market, in terms of function and style. If you want a touch of luxury and quality then this Stainless Steel Zack Scala Liquid Soap Dispenser is the one for you, it looks beautiful with its sleek stainless steel finish and quilt feel. It has a very high gloss and reflective finish which makes it look great next to any contemporary taps. It looks like a free standing soap dispenser but has been designed to be wall mounted. It has a simple push top which releases he soap and has a non drip valve and tap to the front. A high quality and robust soap pump made from stainless steel and a plastic with a steel finish, it looks stunning and certainly the style you would see in any expensive hotel. This wall mounted pump requires screw fixing to the wall and holds 500ml of lotion or shampoo. With a strengthened push rod it is easily used and feel strong and robust, with one click you can access the lotion bottle where you can refill, the slight thin window down the front allows you to see how much gel is left. You can get this in a range of colours to suit your kitchen or bathroom, from stainless steel, to red, black and champagne. 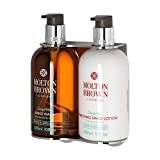 If you buy soap from Molton Brown or Liberty then you may not want to empty the contents into another bottles, however with this double wall mount holder you can install your bottles in your bathroom to the wall or in your shower at a height that makes then easily accessible without having to lift them up. You may have seen this in hotels before which helps keep the area clear and clean while easily being bale to access soap and gels from these bottles. The bottles easily drop into this mount which doesn’t have to be screw fixed as it comes with some double sticky pads to attach to the wall. This is perfect for bottles that are 250-300ml in size. If you want something that perhaps matches your other bathroom fittings, such as towel rail, toilet roll holder or soap dish, then this is a very stylish one tot take a look at. 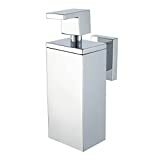 It is made from stainless steel and looks great, a contemporary design that is also available in a chrome finish too. It measures 157mm length by 58mm width by 93mm depth and comes with a 10 year warranty from Haceka. Simple human make great products that not only look great but also have function to match. This wall mounted pump can be bought at a single, twin as shown or as a triple pump set. These are great quality that look very sleek and stylish, they can either be screwed fixed or attached to the wall using the included silicon glue. They are made from durable and long-lasting materials that won’t rust or discolour, the bottles are made from a thick plastic that are transparent which allow you to see the gel and lotion, this looks great with coloured lotions. 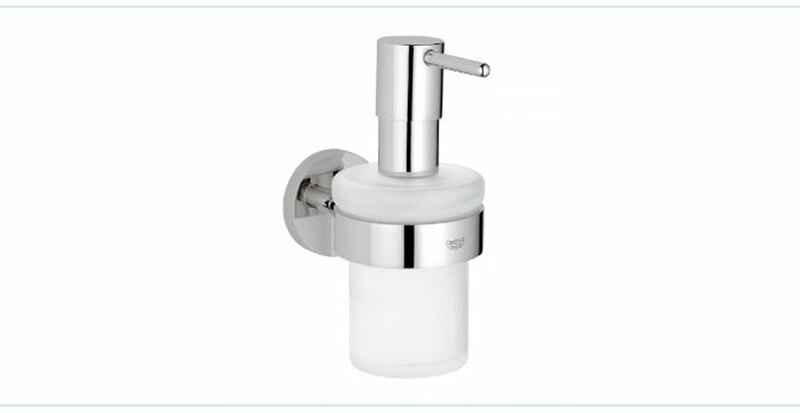 This soap dispenser is a triple pump holder and is designed to be wall mounted on not only a flat wall but it can also be installed in corner, all fittings are included. A simple bracket is installed which allows the triple pump to be attached easier and also removed for refilling or cleaning. Made from plastic it has a chrome finish which looks great and is easy to wipe clean, there are 3 pumps which are easily used and have a convenient push button pump which delivers just the right amount of soap avoiding waste and preventing any mess. Looking like a spray canister this is a compact, elegant and very sleek looking soap dispenser that is easily wall mounted and installed. Made from stainless steel which is highly polished it looks and feel great making it ideal for any contemporary bathroom and adding a hotel and luxurious feel. You can buy this as a standard soap pump or as shown with he wall mounting kit that will allow you to attached it to the wall. The GROHE StarLight comes in a chrome finish that they say ‘stays like new for years’. 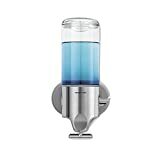 This is a good modern design that will match current fittings, with a stainless steel wall mount and soap pump it has a beautiful glass soap chamber to the base for soap or gel, it is a soap dispenser of real quality. This one isn’t cheap, but you get what you pay for, a very high quality and well built and designed soap pump that will perfectly match your existing bathroom. When buying a wall mounted soap dispenser think about how many pumps you need and what will go in them, soap, shampoo, conditioner, lotion. Think about style, chrome fittings, how big it is, and where it will go. Most require screw fixings while some included silicon glue to fix to the wall or tiles.